It’s officially Christmas on DIY Lifestyle. I hope you all LOVE it because I sure had a blast setting it up. As I am sure you all have seen, I added a new page to my blog, “daily news”, where I share news with my readers regarding my blog as well as some fun interactive links. I have also added a Christmas countdown, a cool Christmas facts tab which shares cool facts regarding the Christmas season, as well as, a new Christmas pop-up. My first Christmas post is going up November 30th at 8 a.m est so make sure you read it because it will help you prepare for the Holidays 🙂 Lastly, I added a Christmas tab to the top of my blog where you will find all of my upcoming Christmas posts and blogmas. No posts are found in the tab yet but they soon will be. And just a quick mention, I did not remove the Thanksgiving tab. I just moved it under “categories”, so do not worry because you can still find all of my Thanksgiving posts under there. I hope you all had a safe and yummy Thanksgiving. I ate so much food and I am still continuing to, curse those Thanksgiving leftovers 🙂 . Who else ate a lot of food? It is very hard not too! Everything just looks so appetizing. Cranberry sauce, stuffing, ham, and ooooo you cannot forget the pies. Pies, pies, pies, pumpkin pies, apple pies, berry pies, I love them all 🙂 I even had pie for breakfast a few times since Thursday 🙂 We had a small gathering but for some reason we were left with a ton of leftovers, which brings me into today’s post. Have a lot of Thanksgiving leftovers? Well do not fret because today I am sharing “terrific thanksgiving sandwiches” to make with your leftovers. Don’t throw them away! Make a sandwich to save the day! 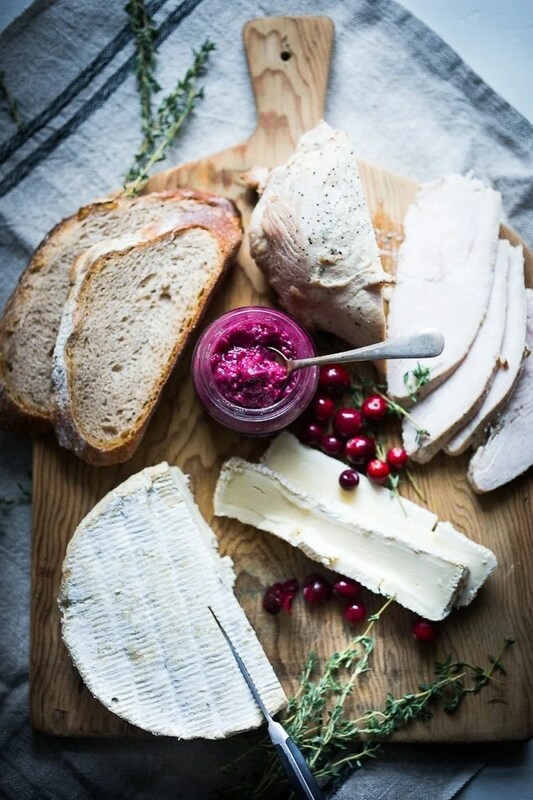 Take two slices of good quality sourdough bread and layer with sliced brie (¼ inch thick) , then turkey, and a few generous dollops of cranberry mustard. Top with the other slice of bread. In a skillet, heat a mixture of butter and oil and toast the sandwich, on medium heat, on both sides until perfectly golden in color. Place in the warm oven until sandwich is heated through and brie is perfectly melty. To make cranberry mustard: In a medium sized heavy bottom pot, sauté the onion over medium high heat until just tender, about 5 minutes. Add the remaining ingredients, stirring to combine, bring to a simmer, cover, and turn heat to low for 10 minutes. Turn heat off, leave covered and let stand for one hour. Check consistency. If you like a looser mustard, add a few tablespoons of water to get it to desired consistency. Preserve like you would jam, or refrigerate. Divide the bread crumbs evenly between two dishes. Add the salt and pepper and mix to combine. Heat a nonstick skillet over medium high heat with a drizzle of olive oil. Place each breast in the bread crumbs, pressing down to help the crumbs stick. Once the pan is hot and the oil is beginning to simmer, add the turkey/chicken and immediately turn down to low. Allow the turkey/chicken to cook for about 4-6 minutes, and the bread crumbs have turned golden. Remove the turkey/chicken to a baking dish. Spread a thin layer of the mayonnaise or yogurt on each breast and sprinkle with a little bit of the separated bread crumbs. Place in the oven to bake for about 10-12 minutes. Remove from the oven and add the bacon and then cheese. Place the chicken back in the oven until the cheese is melted and the turkey/chicken is cooked through, another 8-10 minutes. Place lettuce on a platter and once the meat is cooked, allow it to cool for a few minutes, place on the lettuce and top with the salsa. In a medium skillet, cook the bacon over medium heat until crisp, 6 to 8 minutes. Transfer to a paper towel-lined plate. Spread the bread with the cream cheese. Form a sandwich with the turkey and bacon. Spread it on the bread, then make sandwiches with the sliced turkey and apple. Thank you so much for reading today’s post. I hope you all enjoyed it and remember if you do decided to recreate one of the recipes, or any of the decor ideas/hacks I shared on my blog then tag me @diy.lifestyle.co on instagram and you will be featured on my blog and receive a shout out. Have a happy Monday everyone and I will see you Wednesday! Yum!! Great ideas of what to do with all those Thanksgiving leftovers!! Thank you! I am so glad you enjoyed them! And I hope you enjoy these sandwiches if you decide to make them!